RABAT, Morocco — Morocco spends about a quarter of its state budget on education, a high proportion by any standards. According to the Organization for Economic Cooperation and Development, the average in developed industrial nations is about 13 percent. Yet the results have not saved the country from some serious soul searching. 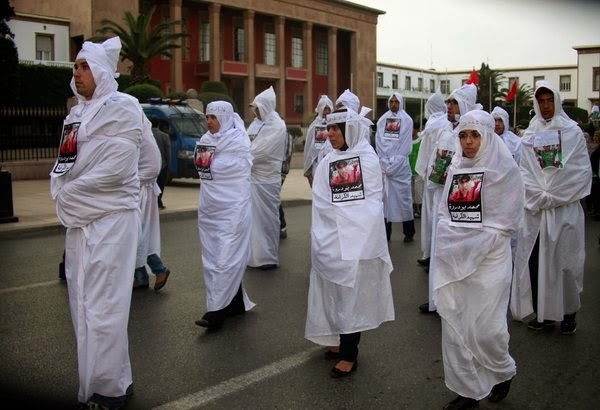 Thousands of unemployed graduates regularly protest in front of Morocco’s Parliament in Rabat, demanding help from the government in finding work in a job market that has become increasingly hostile to new graduates. They say that their education has left them ill-equipped for the workplace. This month protesters blocking the car of Prime Minister Abdelilah Benkirane were dispersed by riot police. Ms. Bouslama is hoping to find work in the renewable energy sector, a growing industry in Morocco, but she is worried that the education she is getting, in a public system that she faults on quality, will not be enough to win her a place in a job market that she says is often skewed by bribery and favoritism. Youth unemployment has risen in recent years above 20 percent and the country faces mounting difficulties in training students and finding jobs for its new graduates despite a big investment. In all, Morocco spends about 5.4 percent of its gross domestic product on education and about one-third of the country’s civil servants work in the sector. There are about 6.5 million students at elementary and high schools and 600,000 enrolled in higher education. The king has blamed his government — led since November 2011 by an Islamist party, Justice and Development — for a lack of progress in adapting education to the demands of the job market. In his speech he called for mandatory foreign language training in university degree courses and a new emphasis on vocational and technical training. Morocco was a French protectorate until its independence in 1956. France built its school system and lessons were mostly in French. In the 1980s, a political decision to reclaim the Moroccan identity resulted in a change in the language of instruction, with elementary and high school classes shifting to Arabic. Most higher education programs, however, remained in French. Many critics attribute high dropout rates to this language switch. University students, they say, are struggling to learn in a language they barely understand. “One mistake was not progressively changing the courses to Arabic,” said Rachid Mrabet, former director of the Institut Supérieur de Commerce et d’Administration des Entreprises, I.S.C.A.E., a business school in Casablanca. “Before, teaching was bilingual, but there still isn’t any courage to go back to that,” Mr. Mrabet said, accusing politicians of reluctance to tackle a potentially sensitive issue: “There needs to be a strong and clear decision and consensus on the language issue for reforms to move forward,” he said. Mr. Mrabet said other problems included an excessive focus in graduate training on quantity over quality; a failure to adapt courses to workplace opportunities; overcrowded lecture halls; student strikes; and school financing issues. The deficiencies of the education system and its failure to produce graduates qualified to work in the modern economy are holding back the country’s development, said Samir Belfkih, a member of the pro-monarchy Authenticity and Modernity Party who sits on the Parliament’s education commission. Instead of hiring graduates of the Moroccan public education system, recruiters tend to look for graduates educated abroad or the products of Moroccan private schools, said Naim Bentaleb, a recruiter with the agency Xpertize, based in Casablanca. As is the situation everywhere else, the greatest challenge for the education system is to adapt to the changing demands of the economy, Mr. Bentaleb said. There are some bright spots: Engineering programs and medical schools are well regarded, Mr. Bentaleb said. Still, Ms. Bouslama, the engineering student in Kenitra, said things had gotten worse, not better, over the years — from elementary school through to university: “If we speak about urgent reforms that the Moroccan education system needs, I would suggest starting with giving Moroccans equal chances to get an education of quality, without having to pay for it,” she said.